We build all kinds of custom equipment, either new designs or modifications of our standard items. The pump station above is a one off design for a local greenhouse with lots of expansion built into the design. There is one variable speed pump which handles the flow requirements of the greenhouse until it's maximum capacity is reached at which time the first additional pump is switched in and the variable pump slows down and then speeds up as necessary to match the flow requirements. 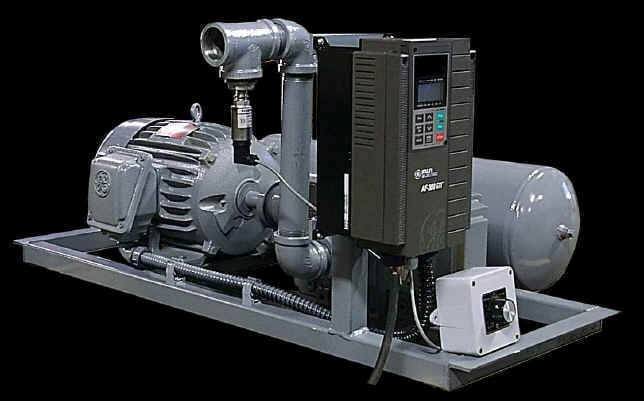 A total of four additional pumps can be added to the variable pump for a range of near zero flow to 750gpm @ 60psi. No pressure tank is required, saving on installation and maintenance costs. 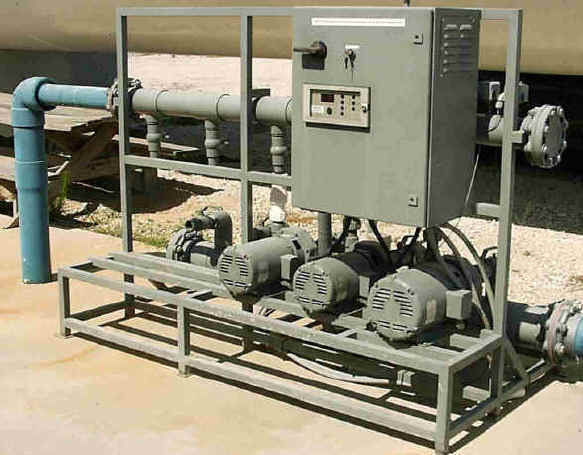 Additionally, the delivered pressure is flat, no pressure variations as the pump cycles on at a lower pressure and then off at the set pressure. The system is always at the set pressure plus or minus about 1psi which allows all the equipment depending on water pressure to operate the same way all the time. The newest feature on the drum seeders is a variable speed, vacuum sensing, positive displacement vacuum pump which offers improved seeding performance because the vacuum does not vary as the drum turns. This allows the vacuum, blowoff and agitation to be set to values the operator knows work well with the seed being used and allows the seeding accuracy to be the same from the first revolution of the drum to the last. The pump is very quiet and not damaged by water ingestion. Vacuum levels to 12"Hg for almost any drum and insert combination. Less than 5hp power consumption; either single or three phase power. The kit will work with any water ejection drum seeder.